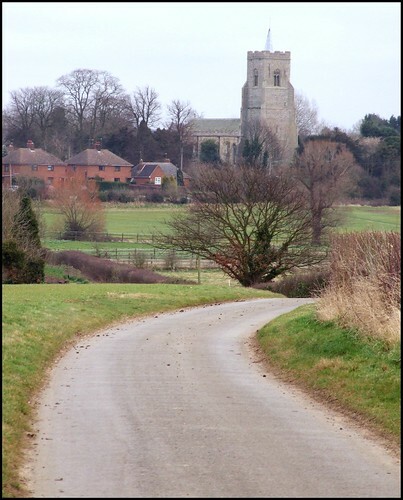 In the early part of 2008, I started cycling around Suffolk again. I'd done the whole county at the time of the Millennium, but the advent of digital photography gave me an excuse to go back and revisit all the churches. That, and the fact I felt I actually knew something about them now, in a way that I hadn't when I'd pontificated about them on this site before. I made a solemn promise to my wife that I would never do Lincolnshire, and in return she said I could do Suffolk again. I remembered this part of Suffolk well, despite, or possibly because of, the fact that it had been one of the first areas I had explored. It was almost nine years since I had last been to Bardwell. It hadn't changed much. Coming this way before, I had been struck how remote and rural this spot was for such a huge church. Having visited some two thousand churches around England since I was last here, I expected to be less impressed, and find it less remarkable. But I was wrong, because Bardwell still seems to me something special. 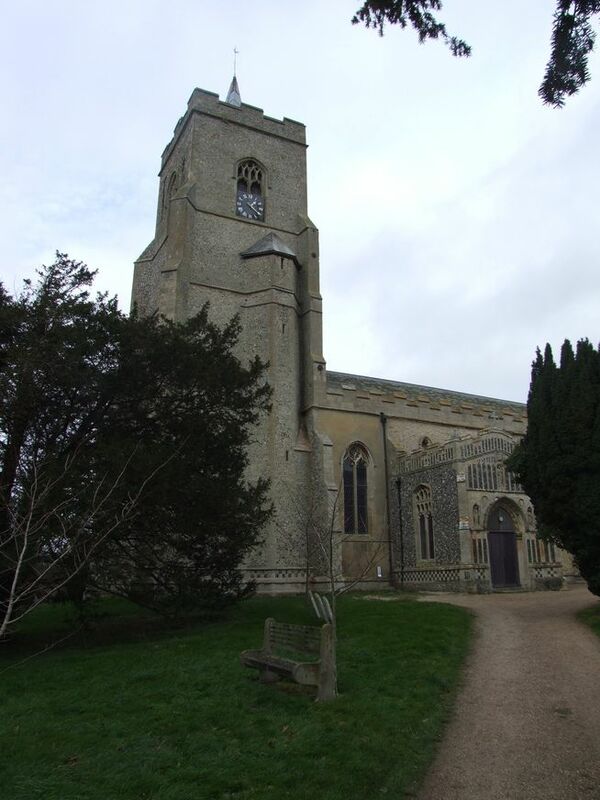 St Peter and St Paul is one of the grander Suffolk churches, but little known. A reason for its lack of fame is an over-zealous 19th century restoration, but there is still much to be impressed by here. 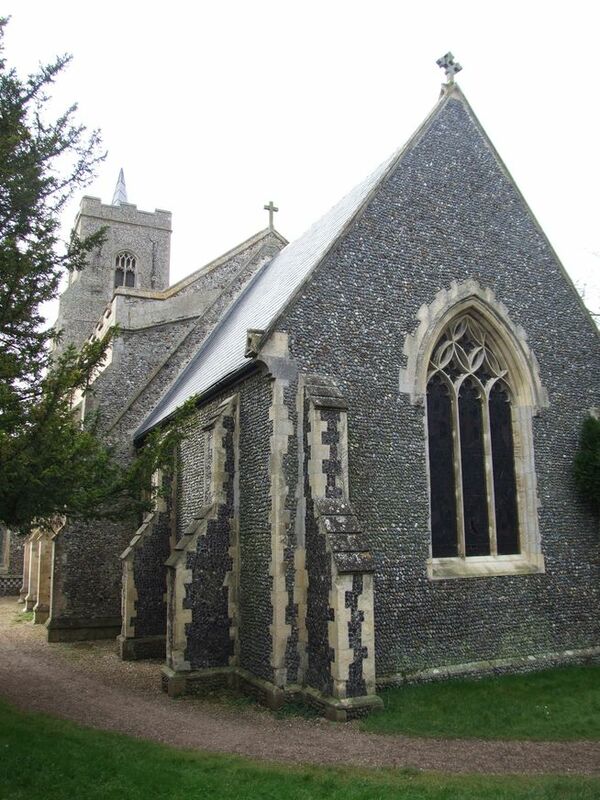 This is a church built on the patronage of old money, much like Long Melford, unlike those Johnny-come-latelies who built Lavenham and East Bergholt. 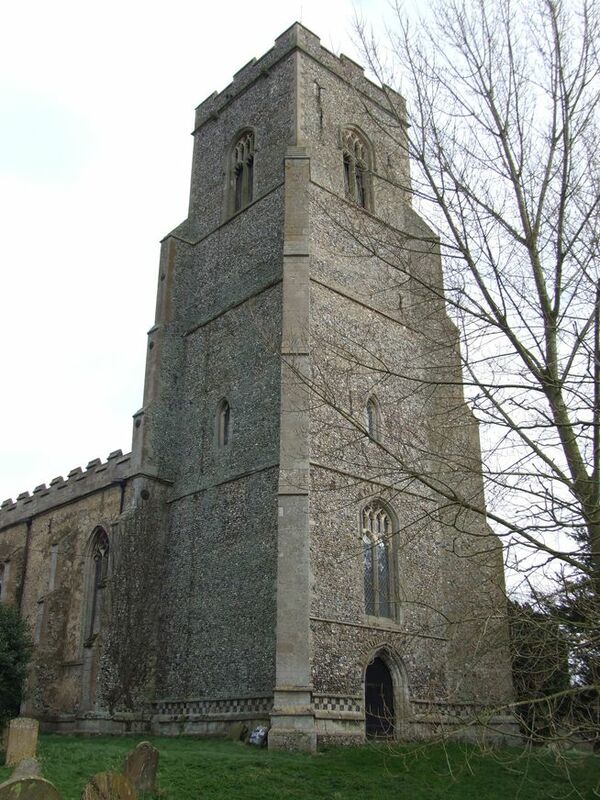 It mostly dates from the first few decades of the 15th century, the gift of Sir William of Bardwell. His tower rises up from its hilltop site, and can be seen from a fair distance away. The churchyard is on the southern side of the compact village. Curiously, it is still possible to see what the builder of Bardwell looked like. You enter through his lofty south porch, which seems grander than it is; an illusion caused by the lack of a clerestory. A similar situation exists at nearby Troston. But this is a lofty, aisleless church, and once inside you have a sense of the perpendicular, and windows with perpendicular proportions, if not perpendicular tracery. Sir William de Bardwell's memorial glass survives. It has been reset in the easternmost window in the north side of the nave, but probably once sat below some grand scheme of devotional imagery in the east window. The image dates from the 1440s; the odd creature with him is a goat. Disappointingly, this was merely his emblem, rather than an unusual pet. Two more figures in the next window westwards are probably Sir Roger Drury and his wife Margery. There is much other late medieval glass, some of it English but also some continental work, including a beautiful pieta. A good word should be said for the way the restoration brough together the medieval glass and some late Victorian work together at the east end of the nave. Together, they fill the space with brightly coloured light, even on a dull day. How different from the ponderous gloom 19th century restorations can so often produce. Otherwise, the Victorian period was perhaps not very kind to St Peter and St Paul, filling it with some heavy wooden furniture and giving an urban patina to the floor. But it also unearthed a series of wallpaintings, some of which can still be seen. Others were copied, and then painted over to preserve them. you can still see a descent from the cross, and there are other bits and pieces, mainly faces. The chancel is rather dark and doomy, but in an atmospheric way. It was almost entirely replaced in the 1850s, but a splendid late-17th century memorial to Thomas and Bridget Reade remains. Their children kneel in different poses, some of them holding skulls to denote that they pre-deceased their parents. St Peter and St Paul is a building which is calculated to impress, especially for being so unexpected in this relatively remote, rolling, rural landscape.